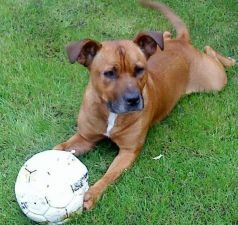 Ollie Urgently needs a new Permanent Home! 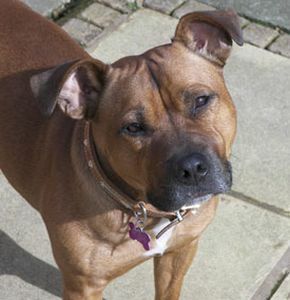 Please meet Ollie, a gorgeous Staffie lad who came into the care of Rochdale Dog Rescue as his previous owner could no longer keep him as he was being left for far too long on his own. 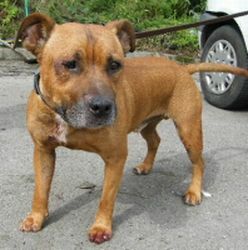 As you can see Ollie is a really handsome chap and would make someone a lovely family dog. 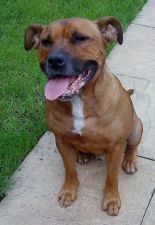 Ollie is very much a people dog and loves being part of a family and spending time with his human friends. 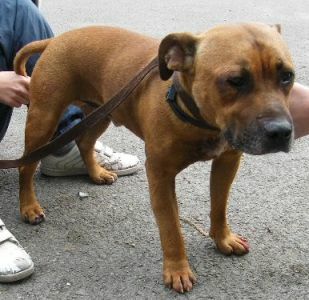 He sadly started to become very distressed at being on his own in kennels. 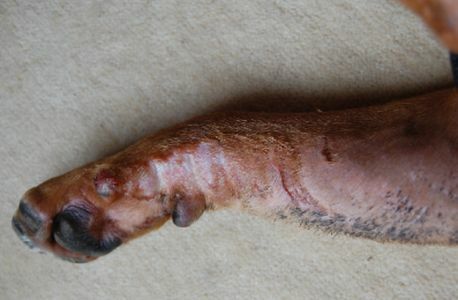 This stress resulted in him harming himself and becoming very depressed and sad. Just look how sad and unhappy he looks compared to when he first arrived. 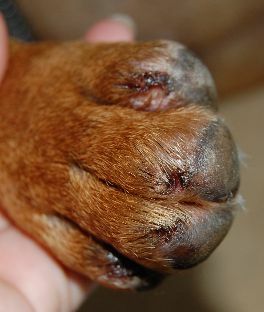 Ollie was suffering not only mentally but physically too, having given himself black eyes and bruising, pulled his claws out, damaged his teeth and leg on his kennel front. 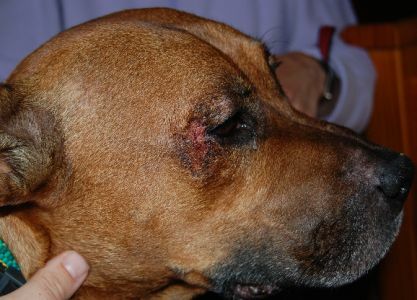 We hated to see such a gorgeous dog suffering like he was. 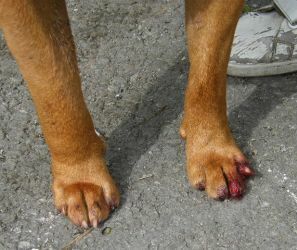 Ollie recieved all the vet treatment he needed but it was clear Ollie could not stay in kennels as he would have seriously hurt himself. He was that bad that one of the wonderful girls at the kennels was sleeping in her car with him. 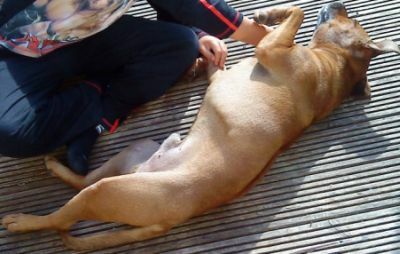 The search began for a permanent home for Ollie, where someone would be around most of the time to help him remember that being on his own is not a bad thing and most importantly to allow him time to heal and be part of a family again - something which he adores. A foster family was initially found and Ollie went from strength to strength before going to a new loving permanent home. 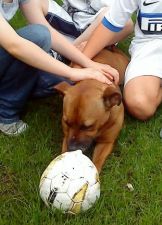 His foster family reported "he is such a pleasant boy, he's brilliant with the kids and he's just adorable". 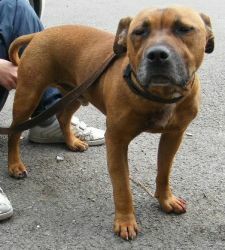 His lovely cheeky Staffie nature soon started to emerge once he was living with a family. Sadly his current owners are no longer able to keep Ollie and it is with much regret that they have asked us to find him a new home. They say he is a lovely dog and it certainly hasn't been an easy decision. As you can imagine there is no way that Ollie can go back into kennels so we are looking to find a new forever family to care for Ollie. Ollies new family will need to have someone around most of the time and be prepared to work on helping him to realise that being home on his own for short spaces of time isn't really that bad. Ollie would need to go into a home where he was the only dog - he is learning that other dogs are OK but would rather have his human family all to himself! He is currently living with children and cats and gets on well with both. He is currently living in the Burton Upon Trent area and prospective new owners would need to be able to travel to this area to meet him.